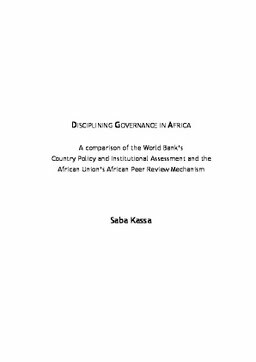 This study examines the promotion of governance in the African Continent. It compares the Country Policy and Institutional Assessment (CPIA) of the World Bank to the African Peer Review Mechanism (APRM) of the African Union. These governance assessments represent differing conceptualizations of governance, particularly reflected in their content and approach. The study answered the following principal research questions: how do the content, process and outcome of the CPIA and APRM support or challenge the good governance agenda; its relation to aid, and what does this mean in the context of power relations of the World Bank and the African Union?